Christos Anesti! Christ is risen! This is a beautiful Greek greeting on Easter morning exclaiming that our Lord and Savior Jesus Christ is alive in our hearts! Eggs are a popular symbol for the spring and Easter season because they represent rebirth and resurrection. 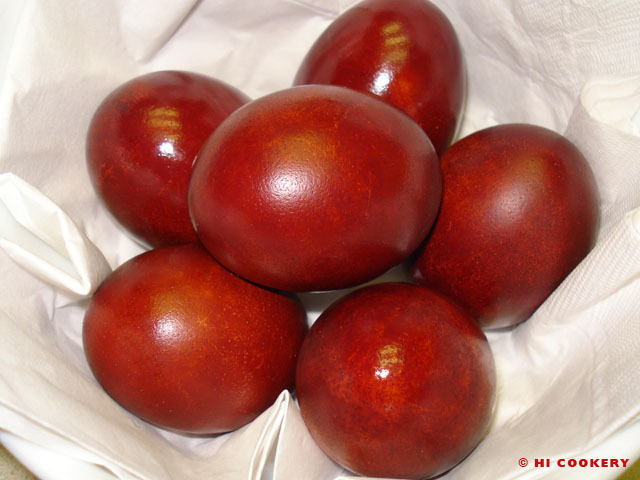 Many are dyed in vibrant hues but traditional Greek eggs (kokkina avga) are red as a reminder of His Precious Blood shed for all. We used natural instead of commercial dyes to color our eggs—by boiling them with the liquid extracted from red onion skins! Red eggs may be placed in a pretty basket, hidden for an egg hunt, used to decorate a braided bread or simply eaten on Easter. The Greeks sure got a great idea to use red eggs for evangelization! Happy Easter! 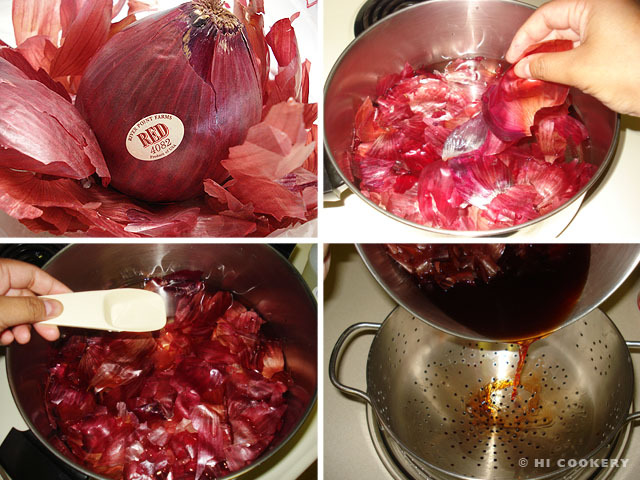 Peel off the skins from the onion and place in a large stainless steel pot full of water. Add the vinegar and bring to a boil. Lower the heat, cover the pot and simmer for half an hour. Strain the red liquid into a glass bowl. Allow the red liquid to cool. In a pot, place the clean eggs in one layer. Pour the red liquid over the eggs to cover them. Boil the eggs for 10-15 minutes but no longer than 20 minutes. 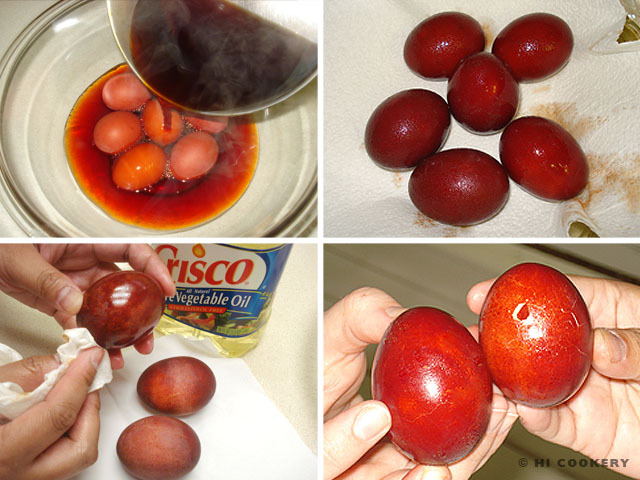 Carefully transfer the red boiled eggs to a glass bowl. Pour the remaining liquid over them and cool to room temperature. Gently dry the eggs on paper towels. Lightly polish the shells with a little oil. Refrigerate the eggs until ready to use. We acquire extra onion skins that fall off in the bins at the grocery store and place them in the plastic bag with our onions. 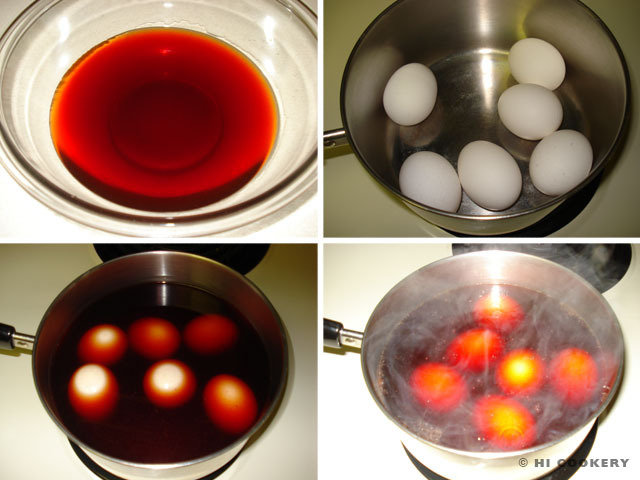 For deeper color eggs, cover the bowl with plastic wrap and refrigerate the eggs in the red liquid for a few days. We recommend dyeing the eggs on the day Jesus died (Good Friday). Then refrigerate in the red liquid. On the third day, the red eggs are ready when the Lord rose (Easter Sunday). The natural dye will stain plastic or wooden utensils and plates. Use stainless steel or glass when coloring the eggs and paper towels when wiping spills or polishing with oil. Olga brought over braided bread and decorated it with red eggs for an edible Easter tradition in both Russian and Greek Orthodox churches. Eastern (Greek, Russian, etc.) Orthodox Easter is celebrated on a date different than Western Christian churches; sometimes the dates coincide with the Julian and Gregorian calendars. Check the chart for future dates of Easter. Easter eggs may be naturally dyed in other colors using a variety of vegetables, fruits, spices, herbs, etc. See the “ingredients” list on About.com – Chemistry site. Search our blog for other Easter and egg recipes. I’m half Greek and I remember the tradition of attempting to crack the Easter eggs very well! Happy Greek Easter.